The best advice stems from failing HARD! If you’re looking to start, grow, and lead your own million dollar business, you must have the right business strategies to take you there. 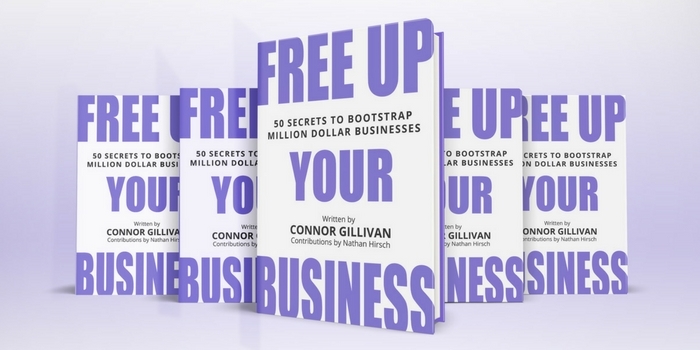 From Connor Gillivan’s experience scaling his first company out of his dorm room to over $20 million in sales on Amazon.com and then building his second company into a million dollar online hiring platform for over 1,000 users around the world, he shares 50 secrets you need in your arsenal of business practices. 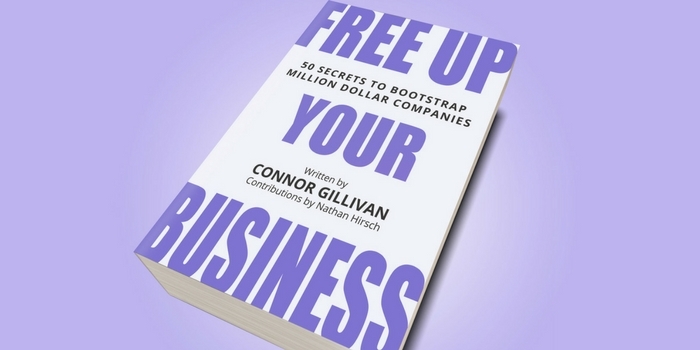 In the book, Connor shares 50 business secrets that he and his co-founder, Nathan Hirsch, have been learning along their entrepreneurial journey focusing on bootstrapping, delegating, building efficient teams, staying productive, and putting the customer first. Each secret is brought to life with real stories from his experiences bootstrapping his first two companies, Portlight and FreeeUp, from his dorm room, college houses, and first apartments. The stories provide a raw look into the life of a hungry and ambitious set of entrepreneurs. The book guides you through 6 core principles of building million dollar companies with step-by-step processes that you can directly apply to scaling your company. Within each chapter, Connor breaks down the secrets that apply directly to those aspects of building your company from the ground up. You’ll learn to set a strong foundation and then scale it through building an efficient and intelligent team of experts. By the end of reading the book, you’ll be inspired to bootstrap your own million dollar company or take your current business to the next level. You’ll walk away with key hacks that you can start implementing immediately to free up your time and you’ll have a motivating story to show you it is all possible. If you’re an entrepreneur or an aspiring entrepreneur, this book is an absolute must read. The lessons held within this book will help you to tackle the most difficult of situations when running your company. The most successful understand that it takes grit and perseverance to build million dollar companies. Connor tells you how he’s done it and how you can too! This is not a typical book…it’s a true inspirational bible. As an owner of an established business, I was pushed to aim even higher. This book gave me the confidence to do it. Definitely a must read for all entrepreneurs. I gained a lot of insights from this book. As an aspiring entrepreneur myself, I was inspired by Connor and Nate’s story of how they bootstrapped not one, but two groundbreaking businesses. It shouldn’t really take millions to start a successful venture and this book will show you how in 50 simple and straightforward secrets. This is definitely a must-read for all budding entrepreneurs and also for established owners of small to large companies. I’m excited to apply these secrets and watch my business grow! 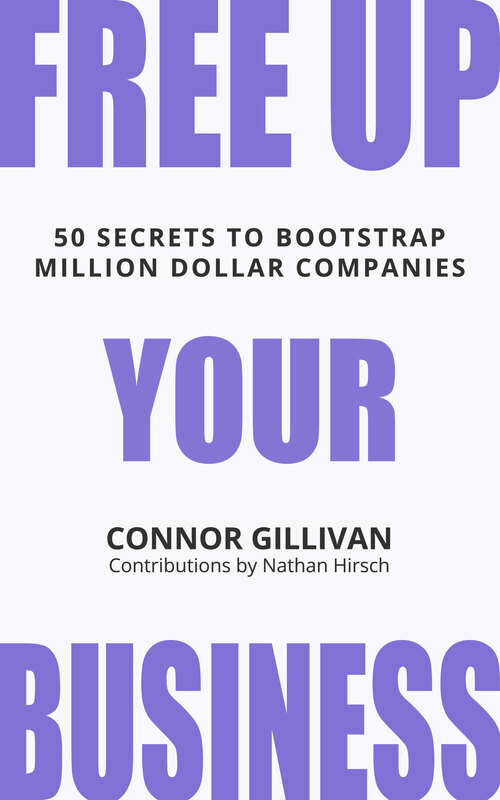 Free Up Your Business: 50 Secrets to Bootstrap Million Dollar Companies is a one-stop-shop for young or established entrepreneurs. Filled with real situations and resolutions to help you build your businesses from ground up, Connor and Nathan, through this book, have paved the way not just in inspiring future entrepreneurs, but will definitely awaken the ‘hungry’souls’ in the Ecommerce industry. Free Up Your Business is jam-packed with great practical advice for starting a business the smart way from finances to time management to handling a team. I wish I had this book when I was at my wits’ end struggling alone with one business after another because of HR issues, burnout, and keeping priorities manageable! Have you ever felt that your business was doomed to fail? Have you ever hit a point where you weren’t sure how to move forward? You’re not the only entrepreneur whose felt this way. I’ve been there too. As an entrepreneur who has been through the thick and thin building two 7 figure online companies, I understand the back breaking work, physically and mentally, that is required to avoid becoming just another statistic. Did you know that most new businesses close within their first year of operations? What is that all about? And the statistic isn’t judgmental to any specific type of entrepreneur looking to start their own business. Every year, hundreds of businesses are started and hundreds of businesses are closed down. Leaving us to ask the question, “why?” Why are so many entrepreneurs losing out on building a long term, profitable company? It’s become too easy to start a business: Entrepreneurs aren’t properly preparing for how difficult it is to start and grow a new business. With the emergence of the Internet, starting a business is as easy as clicking a few buttons in WordPress and you can start selling your product or service. Because of the ease, entrepreneurs aren’t spending enough time learning how to add real value to their customers. There is a lack of guidance: The entrepreneurs that make it past year 1 most likely have a mentor that is working with them as they drive their business forward. 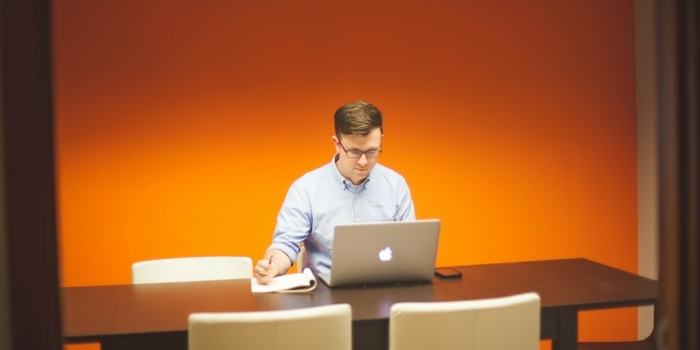 Entrepreneurs aren’t seeking out the right guidance when starting their business. Guidance can be books, educators, online classes, accelerators, and, of course, past business owners. 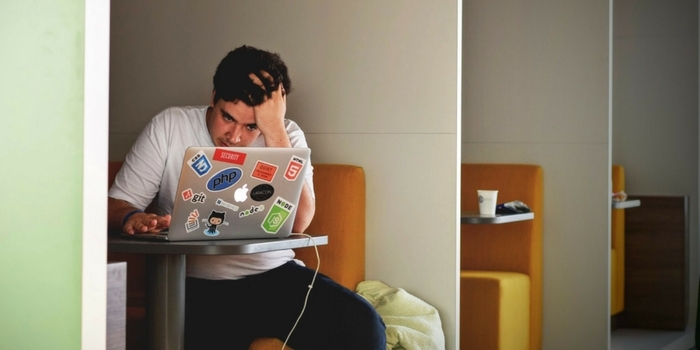 It can be overwhelming trying to start your business from the ground up. If you want to make it past the first year mark (which is completely possible), you must tap into the resources around you. You must focus on the future you want to create and focus on the small steps every single day. For hundreds of years, the greatest entrepreneurs have built their companies into million and billion dollar organizations from the advice they received from others. The information has always been available and it is up to you to capture the right strategies, turn them into your own, and drive forward. Today, it can be hard to get started because of the massive amount of resources that we have at our fingertips. Search engines have made it increasingly simpler to learn anything you want almost overwhelming the user with new information. Similarly, new schools of thought centering around the startup movement have continuously sprouted up as the Lean Startup Method led the way in shaping the way we think about building products and services. With so many options, where do you start? and what do you focus your time on? Having your own strategic business philosophy prepares you to handle the many curve balls that will be thrown at you while running a business. Managing the finances: Know how to price your products to optimize profits. Understand at all times how to manage your spending. Minimize risk when growing your business by focusing on investments that add real value to your company in the long run. Creating the strategic plan: Have a sense of where you want to be in 1 year…at all times. Be definite in your end goal, but stay open to the path to get there. Learn to focus on the daily steps you must take to push your company towards that end goal over long periods of time. Building the systems and processes: Create processes for everything that occurs to make your business run efficiently. Document onboarding guides for future set up. Have a reason for everything that you do in your company. Hiring the right team: Slowly add experts and assistants to handle areas of the business where you should not be spending your time. Create an on-boarding system that sets clear expectations and communication requirements. Hire the best fits for your culture. Leading and managing the organization: Inspire your team to believe in the end goals you’ve created. Teach your team to follow the daily steps necessary to create success. Lead by example. Be consistent in your communication and management. Building a loyal following of customers: Reach the people that love your product and make them trust you. Make your top customers feel special by involving them in your growth. Set up opportunities for your top customers to refer others and grow your customer network. If I Could Build a Million Dollar Company, So Can You! It’s going to be hard work. I’ve already mentioned that. But if you are reading this, you can absolutely make it happen. The most important factors are taking your business extremely seriously, sacrificing the time to get it off the ground, hustling to create your first customers, and believing the future that you want to create. The point of outlining my achievements is not to brag. The point is to demonstrate that I truly know what I’m talking about (and how you can achieve similar success.) I am a writer and an individual that reflects on everything I do. Since I started on this journey, I have been documenting every test, every result, every success, and every failure so that I could consistently improve as a business owner. 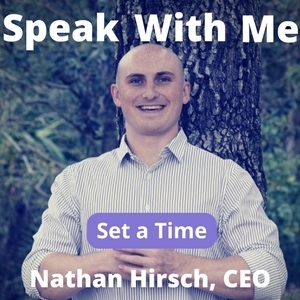 Free Up Your Business is a culmination of the notes that I have taken along with all of the notes that my business partner, Nathan Hirsch, has annotated. The book consists of 6 chapters that break down the 50 most important lessons that we have learned while building our first two million dollar companies. Each lesson is accompanied by an honest, and sometimes raw, story so you can witness how the lessons have directly impacted our lives. If you’re actually serious about taking your business to the next level, you must hammer down the business strategies that are going to allow you to navigate the often murky waters. This is your chance to save some of your time learning from the real life failures (which may lead you to lose your business), and capture the lessons that I have learned over the past 7 years building my companies. Within the book, I present you with tried and true actions that you can start taking within your business to take it to the next level. You’ll find step-by-step guides, proven systems and processes, and simple-to-implement strategies that will change the way you think about your company. Now is your time to make the changes necessary to ensure that you don’t become just another statistic. Now is the time to make sure that you set your company on the right path towards longevity and profitability. Are you ready to get started on your million dollar company? I actually have been stressing over this for quite a while! Where can I get the book? Hi Noreen, you can grab your copy here, or on Amazon. It’s challenging to locate well informed people on this topic, but this is a great read. You know what you’re talking about!